I love cooking and especially baking. Making and enjoying food with family and friends is one of my true simple happy pleasures in life. To me, there’s nothing better than being in the kitchen, pots and oven on the go, BBC radio 4 on the radio and various tempting smells drifting around. One thing I like to make is bread. It feels really elemental and from pizza dough, to foccacia and a wholemeal loaf, there’s something about the whole process of mixing, kneading, proving, shaping and baking that I love. And eating of course! I have heard and read of people describing bread making as very therapeutic and also a good mindfulness, meditative process, something that you can get lost in and really get into a state of flow whilst doing. However I know that some people are a little intimidated by bread making, seeing it as a complicated process fraught with things that can go wrong. 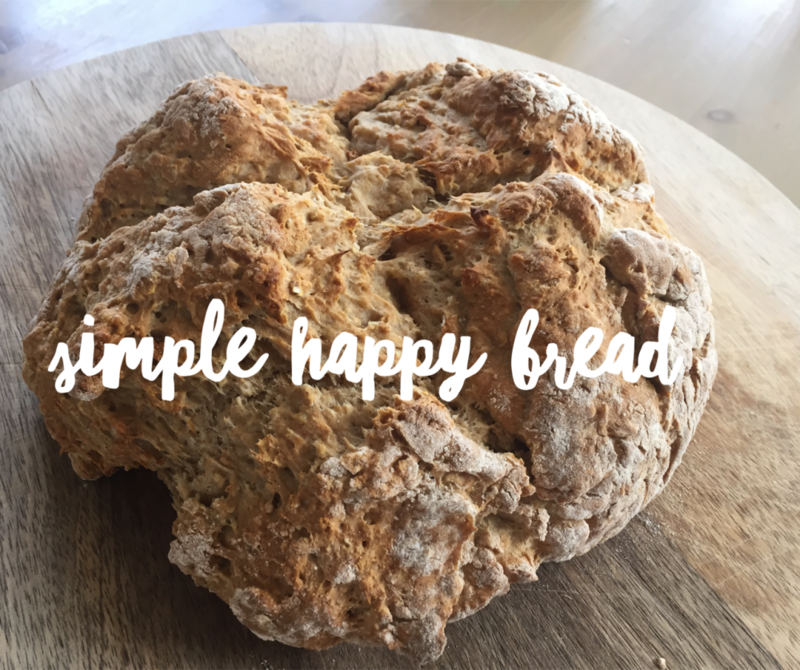 If this resonates with you but you’d really like to make bread then this recipe is for you. No kneading or proving or knocking down, just mixing and baking! Preheat your oven to 200C/gas 6/fan 180C. Then dust a baking sheet with flour. Mix all of the dry ingredients in a large bowl, then rub in the butter, like you do when making pastry or crumble until it’s like fine breadcrumbs. Mix together the yogurt and the milk and then pour into the dried ingredients and mix it in quickly with a table knife, then bring the dough together very lightly with your fingertips (handle it very, very gently, no kneading or squashing!). Once it’s all come together as a dough, shape it into a flat, round loaf measuring about 20cm in diameter. Bake the bread for 30-35 minutes until the bottom of the loaf sounds hollow when tapped. If it isn’t ready after this time, turn it upside down on the baking sheet and bake for a few minutes more. It’s important to cook it through so that it doesn’t get left doughy in the middle. Put on a wire rack, cover with a clean tea towel (this keeps the crust nice and soft) and leave to cool. Eat it whilst still fresh, great with soup. It’s quite cake in texture so it’s not ideal for sandwich but it very nice toasted with butter and jam too! « Give yourself an energy boost!